You can give back to Washington and Lee in many ways. Class of ’94 Inspired to Name Office of Inclusion and Engagement The 25th reunion committee chose to name the office, with a fundraising goal of $1 million, to help all W&L students thrive. 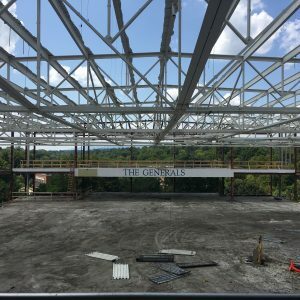 Duchossois Center: Pictures of Progress As construction continues on W&L's new, state-of-the-art Richard L. Duchossois Center for Athletics and Recreation, we offer a virtual tour—no hard hat required! The Class of 2041: Why I Give Reid Calhoun ‘17 shares how his vision for the future inspires his annual giving. The Annual Fund provides a significant percentage of the university's operating budget -- nearly eight percent -- and is the critical difference in W&L's ability to fulfill its educational mission by providing unrestricted dollars that support academic departments, faculty and student research, and financial aid. Today when you give, your gift does more than keep the school going. Your gift helps keep W&L at the forefront of liberal arts in our nation. Learn more about W&L's top fundraising priorities. Check out these options for where you can make a difference at W&L through your gift. As a donor, your support has a great impact on the W&L community. The impact of your gifts is not simply the tangible resources you provide to help carry out W&L's mission. Your support offers inspiration to the campus community in so many areas. Thank you for your generosity. You have honored Washington and Lee with your gifts, and it honors you in return. W&L's fundraising efforts depend on an army of volunteers across the nation who raise support from classmates and parents in the W&L community. Learn more about these fundraising volunteer leaders and about ways you can get involved and encourage others to support W&L.